MAXIMUM EXPOSURE at MINIMUM COST Window Signage — Call Today for a FREE ESTIMATE! Digital Window Mesh Screens are hung from the inside of your store or office, and gives you privacy from the outside — while still being able to see out yourself. The DuraScreen material also includes Sunlight Diffusion for outdoor facing window advertising. These custom designed screens install and remove with ease, are extremely economical and affordable at a fraction of the cost for typical window advertising graphics. BONUS! 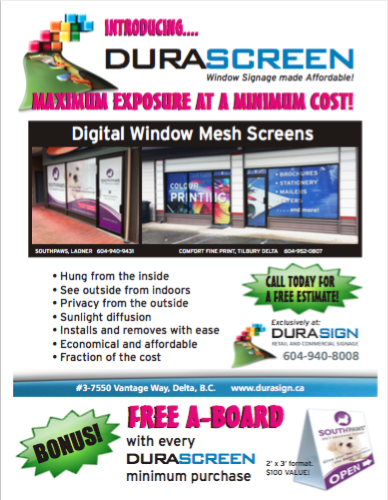 — FREE “A-Board” with EVERY DuraScreen minimum purchase! 2′ x 3′ format = $100 VALUE!